What’s Bob the Blob all about? The goal of the game is to complete the most wild and diverse platformer levels as fast as possible, while collecting the required amount of blobs. The levels take place all over the universe where Bob gets to travel to with the amazing DDD Device which takes him from one place to another. You also get to goof around the laboratory of the Professor who created you, and investigate various places which open up as the game progresses. The Professor helps Bob with different super powers, such as double jumps, squeezing and a long jump. Prof may also want Bob to collect components for his World Peace Machine, scattered around the levels. There are also lots of interesting extras, secrets and other unlockable content to be found around the game. 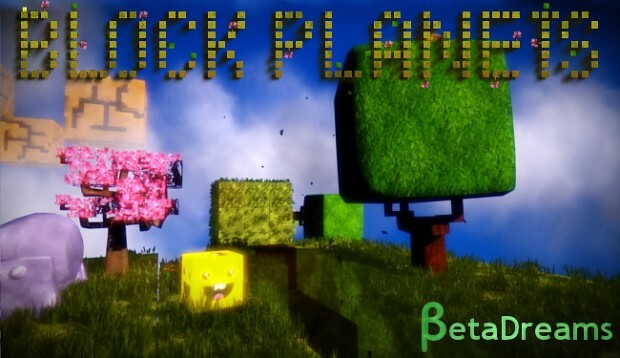 Block Planets BetaDreams' everlasting game project is on its way to be the most polished game it deserves so much to be. The main reason why this haven't happened yet is ‘cause to Epic games UDK game engine. UDK got updated with very very very bad builds about year and half ago. These updates caused UDK to have two really big bugs which we call RAM leak and collision bug. The so called RAM leak caused Block Planets or if you want to be specific UDK didn't freed RAM after it was. Collision bug was worse than RAM leak. With the collision bug dragging us down we couldn't move Block planets' collisions in real time. That's terrible thing to have in a game which constantly moves and check collisions. This problem have taken major amount of our time and ran us to a burnout. We tried for months to solve the problem of collision bug with no success or any notable progress. Then we tried to play the Epics waiting game and hoped they would be kind enough to fix their own bug but for our misfortune Epic wasn't eager to do anything except to write to their forums everything will be ok in matter of "months". We understand why they didn't fix UDK. It was going to be an old game engine. After all Unreal Engine 4 was a round the corner and it was expected they would much rather put all of their resources to make UE 4 as good as possible rather than fixing UDK. But it is good to live hoping for better future. So after some time off we managed to go around the problem and things started to get normal again. We are making good progress in clearing our code, making better and polished levels and re-designing our user interface. It is true these bugs caused us to work over time around the clock for month's almost full year. This stopped every progress and almost burned out us completely. What we gained after we went through all of this? Almost nothing. But now in retrospect we are kind of glad that we were forced to apart from the game for some time. Hi everyone! BetaDreams is back. Read what happened and what's yet to come. Kazong! 1.1 Released in App Store! Kazong! 1.1 has been released and it is free to download from the App Store! Check it out! Also info about the website & trailer! This is the HD version of the professor Doc's lab video. This is the demo / Prologue game of our upcoming game Bob the Blob. Something to listen while waiting for more Bob the Blob information. Some music for all of you fans. Something to listen while waiting for more Bob the Blob information. This HD quality video explains our new movement and combo system. This is HD version of the early gameplay teaser showing the current state of the development. We hope that you enjoy it! This is awesome, perfect for here and then. A mobile version would be appropriate. I'm glad to hear that. And now when our demo is released how would you rate our game, on grades 1 to 10? And if anyone have anything to complain about or some new ideas just inform us about it. We will take notice that and consider it. Am I the Only Person who thinks that this game is really good? I actually like it too :D ! Hope that you like the upcoming demo.